Turn on: If your Apple Watch is off, press and hold the side button until the Apple logo appears (you might see a black screen for a short time first). The watch face appears when Apple Watch is on. 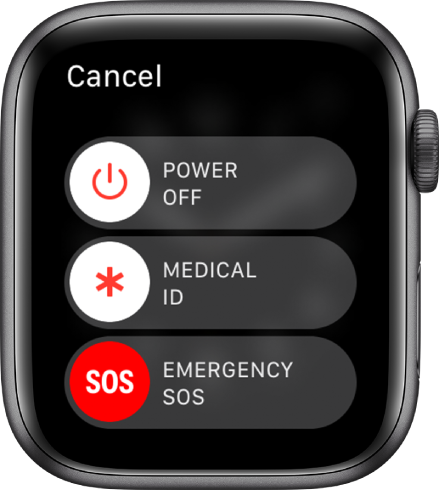 Turn off: Normally, you’ll leave your Apple Watch on all of the time, but if you need to turn it off, press and hold the side button until the sliders appear, then drag the Power Off slider to the right. Tip: You can’t turn off your Apple Watch while it’s charging. To turn off your Apple Watch, first disconnect it from the charger. Raise your wrist. Your Apple Watch sleeps again when you lower your wrist. Tap the display or press the Digital Crown. Turn the Digital Crown upward (Apple Watch Series 2 and later). To allow this, open the Apple Watch app on your iPhone, tap My Watch, go to General > Wake Screen, then turn on Wake Screen on Crown Up. If your Apple Watch doesn’t wake when you raise your wrist, make sure you selected the proper wrist and watch orientation. If your Apple Watch doesn’t wake when you tap the display or press or turn the Digital Crown, it may need charging. Tip: If you don’t want to wake your Apple Watch when you raise your wrist, open the Apple Watch app on your iPhone, tap My Watch, go to General > Wake Screen, then turn off Wake Screen on Wrist Raise. Or, to temporarily prevent your Apple Watch from waking when you raise your wrist, use theater mode on your Apple Watch. You can set Apple Watch to return you to where you were before it went to sleep. Go to General > Wake Screen, and make sure Wake Screen on Wrist Raise is turned on. Scroll down and choose when you want your Apple Watch to wake to the last app you used: Always, Within 1 Hour of Last Use, Within 2 Minutes of Last Use, or While in Session (for apps like Workout, Remote, or Maps). Choose While in Session if you want your Apple Watch to always wake to the watch face (except when you’re still using an app). You can also do this using the Apple Watch app on your iPhone: Tap My Watch, then go to General > Wake Screen. You can keep the display on longer when you tap to wake your Apple Watch. Go to General > Wake Screen, then tap Wake for 70 Seconds.